Samsung Group, based in South Korea, is a multinational conglomerate company involved with electronics, mobile phones, displays (LCD, Plasma and OLEDs), materials, insurance, finance, advertising, heavy industry and more. Samsung is researching graphene and it's the company with the most graphene related patents in the world. Samsung is also invested in XG Sciences and the two companies are co-developing graphene-enhanced batteries technology. A joint research conducted by Samsung Advanced Institute of Technology and Sungkyunkwan University in Korea yielded an original technology for synthesizing amorphous graphene. Amorphous graphene is a material with different properties than crystalline graphene. It has lower conductivity and according to the researchers it can be suitable for various industries including desalination. Will Samsung's Galaxy S7 sport a graphene-enhanced battery? In June 2015, researchers at the SAIT (Samsung's Advanced Institute of Technology) found a way to prolong the life of the standard lithium-ion batteries by using a new silicon cathode material "coded with high-crystalline graphene". Recent talk around the web suggests that this discovery may find its way to Samsung's Galaxy S7 and grant it a 5-day battery. Samsung researchers reportedly developed materials that can be used to double the capacity of Li-ion batteries. The key to the more efficient batteries is a new graphene-based cathode material. It is a new silicon cathode material "coded with high-crystalline graphene". 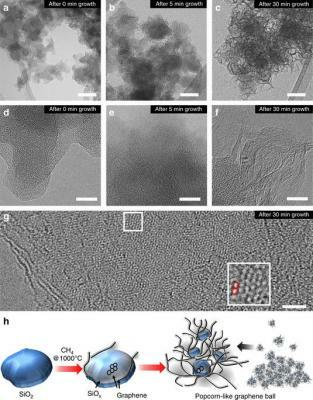 As deployed in its lithium-ion batteries the new cathodes produce cells "with twice as much capacity as ordinary lithium-ion batteries," according to various reports. This research presents a dramatic improvement of the capacity of lithium-ion batteries by applying a new synthesis method of high-crystalline graphene to a high-capacity silicon cathode. Samsung's team used silicon cathodes instead of graphite ones; this is not a novel approach, since many previous studies have also used it. The challenge, however, is that the silicon can expand or contract during the battery charging and discharging cycles. Samsung addressed this issue by creating a process to grow graphene cells directly on the silicon in layers that can adjust to allow for the silicon's expansion: "The graphene layers anchored onto the silicon surface accommodate the volume expansion of silicon via a sliding process between adjacent graphene layers. When paired with a commercial lithium cobalt oxide cathode, the silicon carbide-free graphene coating allows the full cell to reach volumetric energy densities of 972 and 700 Wh l-1 at first and 200th cycle, respectively, 1.8 and 1.5 times higher than those of current commercial lithium-ion batteries." Researchers are developing flash memory devices that store the charge in nanocrystals instead of the usually used polysilicon layers. These kinds of devices are less sensitive to local defects and offer high-density memory potential. Researchers from Samsung Electronics (and Korea's Kyung Hee University) are now developing similar flash devices based on graphene quantum dots (GQDs). The performance of such a device is promising, with an electron density that is comparable to semiconductor and metal nanocrystal based memories. Those flash memory can also be made flexible and transparent.